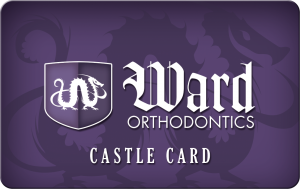 Dr. Ward is a specialist in orthodontics and dentofacial orthopedics. Although many people know what orthodontics is, most people have never heard of dentofacial orthopedics. The following will help to explain orthodontics and dentofacial orthopedics. Ortho, a term originating from Greek, means “to straighten” or “to correct”. Dontic comes from the Greek word for “teeth”. While orthodontics involves straightening teeth, dentofacial orthopedics focuses more on guiding facial growth and development. Both specialties, however, use many of the same techniques and appliances. These include braces, headgear and expanders. There are instances when orthopedic treatments precede conventional braces, but most of the time the two are done simultaneously. For example, a child wearing braces and headgear is undergoing both orthodontics and dentofacial orthopedic treatment at the same time. By being knowledgeable and skilled in both orthodontics and dentofacial orthopedics, Dr. Ward can diagnose and treat problems with both the teeth and the facial structure. Orthodontic treatment often encompasses movement of both the teeth and the jaws.